I saw it on Wednesday and thoroughly enjoyed the film. Nick Robinson, Josh Duhamel and Jennifer Garner were all excellent in their roles. Two scenes got me misty-eyed, both speeches between parent and son, the "you get to exhale now, Simon" scene with Jennifer and Nick, and the "I wouldn't change a thing about you" scene with Josh and Nick, both heartfelt scenes were very moving. And I loved his teacher, portrayed by Natasha Rothwell, her scenes were fun and I loved the way she delivered her dialogue. The way she handled the students being nasty to Simon was priceless. It's a very engaging gay teen comedy. Can we have more please? Nick Robinson as Simon is unforgettable. His scenes at the end on the ferris wheel - as he waits, hopefully, for his teen crush - are memorable. I loved the movie but have two issues - I do wish Simon had punched the guy who outed him in the face- because he deserved it- but Simon is nice sweet kid and he would never do that. The final reveal made sense within the film but I thought he had better chemistry with another guy. I am so glad that the mystery man did not turn out to be the middle-aged male teacher (who had definitely seen better days). No that would have just been weird! Jake Bain and Hunter Sigmund celebrate their relationship with classmates. "Love" is in the air. I asked the cashier at my local movie house - if I could have the movie poster - the film was ending the next day - happily, he said that I could have it - the next day, in the late afternoon - I can't believe that I actually have it! I finally saw this film tonight. I liked it -- some of it alot. But some of it made me very uncomfortable. The evil Martin -- what he did could have had (has had, in real life) disastrous consequences. I don't accept his "redemption" at the end, if that's what it was. But it is kind of a landmark film. I finally caught up with it on HBO too and also liked it, with reservations. For one thing, I went to high school in the early 1960's, and it was disheartening to see how familiar it all looked after more than fifty years of "progress". We know from Kinsey and others that a good percentage of those kids in that high school must be gay but there's still that wall of mystery around it all. There's closeted Simon, there's the school "f*ag" who takes the heat for everybody else and there's one other "mystery" gay....It made me want to scream out of frustration if this is where we still are. I agree that Martin's "redemption" seemed too easy, and it even seemed that Simon's may have been too easy as well, since he really sold out his friends and straight-up lied to and manipulated them to protect himself. And what about kids who don't have "cool" parents? What if the person Simon had poured his heart out to anonymously had turned out not to be "cute"? I agree that it's a landmark film in its way, but, in spite of the somewhat tortured path Simon has to take, the over-all "feel good" vibe (John Hughes was mentioned earlier.) seems to obscure potential collateral damage which could be just as educational to look at. There are so few films like this still that it's probably inevitable that we'd want them to be more than they are, so I hope I haven't sounded immune to the movie's charm. But I hope young people who like this film will give their attention to other, more profound, films about the difficulties of gay life. Interesting comment. However, just because one single film shows something going on, it doesn't mean all filmmakers agree those are the only, or even the most real, issues affecting gay youth. Watch a film like this and decide if it's accurate or if it's too narrow in its depiction of problems. Films in this sub-genre tend to rely on tropes, and they can hardly be seen as documentary. Of course. I understand that this is just one film, but unfortunately it becomes ripe for comment when there are so few others. The initial comments I'd heard about the movie when it was released led me to believe it maybe didn't rely on tropes and, even though I understood there wouldn't be a documentary thoroughness in exploring its subject, I hoped it would be satisfyingly realistic. In large part it was. The character was seen in a variety of contexts: homelife, school, extra-curricular, and non-school-related activities with his friends. His friends were bright and charming, which made the corrosive secrecy involved in his sexual identity particularly frustrating because, as I mentioned, it had uncomfortable echoes of my own youth 50+ years ago. I've heard stories from young gay voices which have made me hope that the overall environment in our schools had shifted in a more positive direction, but this movie made me doubt that and now I'm more unclear than ever. In any case, it's important that (particularly young) movie audiences understand that the struggle is real and that they (we) all have a part in it. I haven't seen the film, but it seems odd to me to try to turn someone's sexuality into a mystery story. It seems wrong, actually. Isn't there a mystery about who he's interested in? I think when they go that direction with it, then it becomes too cutesy, too "guess who I like" and loses any sort of gritty realism it might otherwise have had. Of course they're appealing to a certain audience that wants the movie to be fun and wants the experience of watching it to make them feel all happy at the end. But I don't think such an approach really helps illuminate much. My view. It's very much a part of the social media era in which mystery and innuendo seem to flourish. Simon opens up to someone anonymously and inevitably becomes curious about this person's real life identity. Simon is outed when someone accidentally sees his postings and takes screen shots, which are used to blackmail Simon into betraying one, then others, of his friends. When it all finally goes public, his online friend disconnects from Simon since he's become "toxic". There's irony in the fact that someone who inspired Simon abandoned him, but then is ultimately inspired by Simon in return. So it doesn't lose all the grit. Neither is it excessively cutesy, though the 100% supportive parents lean in that direction. It's a fairly honest attempt to sketch a character at a crossroads in his life who comes under public scrutiny before he's really ready. The blackmail idea is maybe a gimmicky way to do it, but it does show the compromises gay people have to consider, whether they act on them or not. Thanks. Yeah, it sounds like the blackmail thing is a bit too cloak and dagger, especially for characters at this age. In fact it kind of seems like a storyline on Hollyoaks. How would someone so young would be at such a crossroads-- they really haven't lived long enough. Does the drama seem like it's been ratcheted up to epic proportions? In fact this story could be spoofed with baby characters who are blackmailing each other at a daycare about some absurd personal secret. The parents have to be supportive because that's the politically correct thing for them to do. If they were unsupportive in any realistic way, it would defeat the filmmakers' purpose for the story. It's a gay parable preaching acceptance. No, not to epic proportions, though I think you're right that it's a kind of gay parable. Much of it is friend-on-friend moments which have the ring of truth to them. But the thing about that age, and I can pretty clearly recall myself back then, is that things which rock your life like that do seem epic. I think it's because we haven't lived long enough at that age that we're knocked for a loop by things which are unanticipated and which go against the grain. I was closeted until college, and even beyond that in some cases, and in high school I equated the possibility of discovery to personal humiliation just as Simon did. As I said in my first post, it was dismaying to see that dynamic still in action for at least some people of that age in the present day. My first response was to question the authenticity of Simon's experience in these more "enlightened" times, but I'm realizing after some thought that we only have to look to The Trevor Project and the It Gets Better movement to know that kids still suffer in solitude and are desperate for guidance and understanding, to the point where lives are lost. 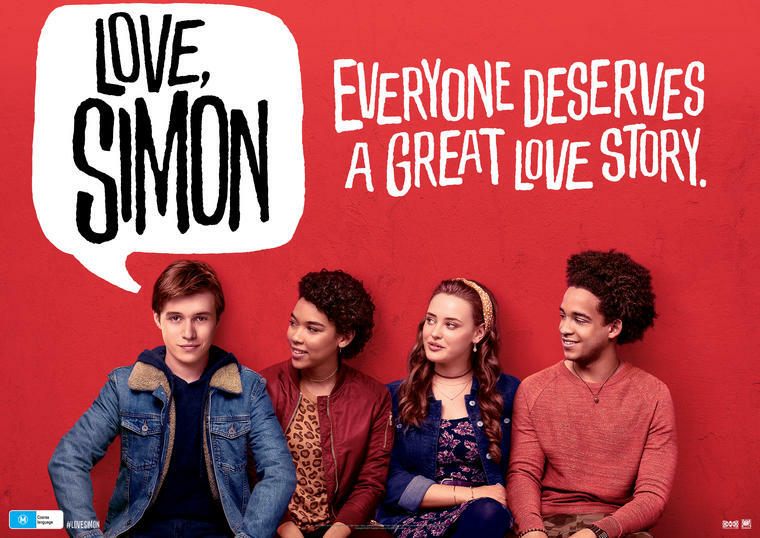 Simon may not be the most eloquent statement on the subject, but the fact that it made it to neighborhood theaters and the cultural mainstream seems to signify that it's reaching, and maybe helping to create, an audience. Growing up gay is still a difficult experience- specially if your family is not as supportive as Simon's. And I'm glad I was not a teenager in our social media age. 2. Simon would have known that Bram was Jewish, because the character's full name is Abraham Greenfeld, which Simon would have known. Since there may not have been a huge Jewish community at that school, Simon would have connected Bram and the Chanukah/Menorah email with Bram, even despite that awkward kiss between Bram and the girl at the party. Yes, Simon was wrong, terribly wrong, in allowing himself to be blackmailed by Martin. But Martin, in the film, was such a creep. He would have done a great deal of damage to Simon's well-being. It's interesting that in the school production of "Cabaret", Martin is playing the creepy MC. Also, yes, Simon should have guessed from Blue's email about his holidays that Blue was probably Bram. The film kept Blue's identity a secret for such a long time. It was a cheap shot to show Blue kissing a girl at the Halloween party. But, at the end, Simon and Bram on that ferris wheel was a celebratory shot. Although I did enjoy the film a great deal, I do wish there had been a more positive spin on the essential story - coming out in high school. Instead, we have Simon being forced to deal with a jerk like Martin. Of course, Simon could've told Martin to take a hike and dealt with coming out in his own way. That's what troubled me. Martin's outing of Simon in such an outrageous way -- not only outing him but revealing very private emails very publicly -- that's the kind of thing that has led to teen suicide. I found that part of the story very disturbing. If the outing had to be a plot point, it could have been done differently. The way Simon dealt with it showed his strength, though. One very brief scene that I found quite touching was Simon walking through the school hallway after he posts his own coming out post. As Simon passes a group of younger students in the hall, one younger boy cheers him on. So you think, Simon did it for him as well. Very sweet moment. The film is based on a recently-published novel. I just wonder how faithful the movie is to the book. This one might make a unique Broadway musical. I'd definitely make changes, though. Simon would have to be stronger. Let us not forget Tyler Clementi.